Papaya Halwa is a simple, nutritious and yummy sweet dish .It can be made for special religious events and can be eaten for vrat / fastings also. First rinse and peel the papaya. Cut into half and remove the seeds and pith from it.Slice the papaya and chop finely. In a pan add the milk and let it boils. In a Kadai or pan fry the cashews and raisins in a tbsp of ghee and keep it aside. For making Almond Powder I crushed 15 almonds in a mixer. Add a tbsp of ghee in a same kadai or pan. Then add the papaya cubes. Cook on a low flame for about 15 minutes.Keep stirring in between. The fruit will release it juices and little bit change the color. Now mash the papaya well with the back of the ladle. Now add the boiled milk in the papaya sugar mixture and keep stirring for about 20-25 minutes on low flame until ghee will start to separate. Cook for 5-6 minutes more till the whole halwa has gotten together or halwa starts to leave the sides of the pan. Add the cardamom powder and fried cashews and raisins to the halwa.Switch off the stove. Now Healthy and Lip Smacking Papaya Halwa is ready !!! Serve the Papaya Halwa warm . Keep it in a Fridge and You can also serve the Papaya Halwa as a yummy cold dessert. You can adjust sugar according to your taste. 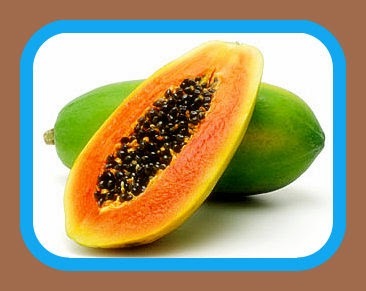 If Papaya is fully ripe You need to add very little sugar. Add boiled milk only if you add cold milk it will curdle.